A modern flat profiled Titanium ring with an offset inlaid band of 18ct Rose Gold. The two metals are separated with a wide highly polished channel. This channel is set with a single brilliant cut white 2mm (0.035ct) Diamond, the remainder of the ring is finished with a beautiful satin texture. 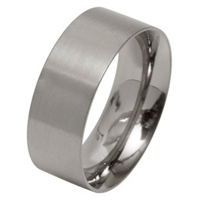 Measuring 6mm wide, the ring is slightly curved and smoothed on the inside for comfortable wear.